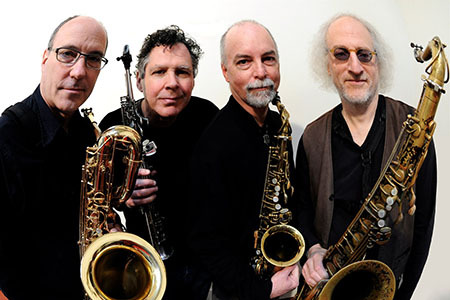 For over 30 years, Rova Saxophone Quartet has explored the synthesis of composition and collective improvisation, creating exciting, genre-bending music that challenges and inspires. Founded in 1978 and inspired by a broad spectrum of musical influences – from Ives, Varese, Messiaen, Xenakis, and Feldman to Art Ensemble of Chicago, Coltrane, Braxton, Lacy, Taylor, Sun Ra and Ornette Coleman – Rova began composing, touring, and recording, collaborating with such like-minded colleagues as guitarists Henry Kaiser and Fred Frith and saxophonist John Zorn, along with fellow Bay Area trailblazers Kronos Quartet and Margaret Jenkins Dance Company. In 1983 Rova became the first new music group from the USA to tour the Soviet Union; Saxophone Diplomacy, a documentary video of the tour, was aired widely on PBS. Rova has since had many other notable collaborations: quintets with Anthony Braxton and Steve Lacy; a sextet with Fred Frith and Tom Cora; the saxophone octet Figure 8 with Tim Berne, Glenn Spearman, Dave Barrett and Vinny Golia; and joint projects with bands including Mr. Bungle, the Splatter Trio, and the Hub. Their new projects are the Celestial Septet with the Nels Cline Singers, and Electric Ascension, an epic re-imagining of John Coltrane’s masterwork with an all-star large ensemble. The list of composers who have written music for Rova is likewise long and illustrious: Anthony Braxton, Henry Threadgill, Jack DeJohnette, Terry Riley, Alvin Curran, Marty Ehrlich, Mark Dresser, Tim Berne, Annie Gosfield, George Lewis, Fred Ho, Muhal Richard Abrams, Robin Holcomb, Wadada Leo Smith, Lindsay Cooper, Fred Frith, Henry Kaiser, David Lang, John Carter, Chris Brown, Pauline Oliveros, John Butcher, Satoko Fujii, Barry Guy, Dana Reason, Gino Robair, Myles Boisen, and Miya Masaoka, among many others. Rova’s members have written extensively for the group themselves, and have also created collaborative pieces such as Radar, an improvisational piece based on a system of hand gestures.